This Scottish trade union figure and socialist leader, a founder of the British Labour Party, headed the Scottish Miners Federation and fought for coal miners rights. TLS, 1p, 8½" X 11", Larkhall, Scotland, 6 July 1929. Addressed to H.K. Weyner. Near fine. Interesting letter to an American admirer who asks "if I could give you a specimen of my hand writing, as you are interested in this matter being a student of graphology.... I have never been much of a writer at any time, as I was denied the right to an early education and as years roll on, I am afraid that matter are getting worse with me, as my hand is now very shaky, as the result of rheumatics...." Transmits (not present) "a short quotation from Russell Lowell, which is one of my favourites...." Nicely (and not shakily) signed in brown ink. Smillie was orphaned early and went to work at age nine to help support his family, so struggled to educate himself as a juvenile. Most unusual. This prominent women's rights advocate, journalist, abolitionist and temperance movement advocate was one of the leading lights in 19th century reforms along with such figures as Julia Ward Howe and Lucy Stone. Bold and nice "Mrs. Mary A. Livermore / Boston" in brown ink on a heavy stock 3¼" X 1 3/4" card, n.y. Very good. Small glue stain at lower right (not affecting signature); mounting traces on verso. Undated, but likely of 1870s or '80s vintage. Accompanied by a superb heavy stock 5¼" X 8" steel-engraved head-and-shoulders portrait of an older Livermore (published by A.D. Worthington & Co., Hartford, CT) -- likely the frontispiece to her 1889 memoir, "My Story of the War: A Woman's Narrative of Four Years Personal Experience as Nurse in the Union Army and in Relief Work at Home in Hospitals Camps and at the Front During the War of the Rebellion." A handsome pair. This young Chicago journalist married renowned Chicago attorney Clarence Darrow in 1904 (his second wife), remaining with him until his death in 1938. Inscription and signature on the inner panel of a three-panel 3¼" X 5¼" buff stock printed card. Near fine. Outer panel features small grey-tone graphic showing sunlight streaming through a church's stained glass windows and the phrase "With / Sincere Thanks" along the bottom, while inner panel bears printed message "Your sympathy / and kindly / thought will always / be held in / grateful remembrance" -- below which she pens in black ink "by your appreciative, / sorrowing / (Mrs. C.) Ruby Darrow." She has slightly smudged the words "sorrowing" and "Mrs." A small but moving memento sent in response to a condolence message sent her by future Lincoln/Civil War scholar Arnold F. Gates (1914-93) upon the death of her husband in 1938. Unusual and uncommon. Famed American labor leader; AFL-CIO president (1955-79). Color PS, heavy stock 8" X 10", n.p., n.y. Very good. Candid half-length glossy photograph showing an elderly, smiling Meany seated seated in suit and tie. In a light area across his white shirt and tie, Meany signs boldly in blue fineline. A superb example. This well-known Welch temperance advocate enjoyed a career as sailor and sea captain before becoming a mover and shaker among the Good Templars, establishing many hundreds of lodges and children's lodges throughout Wales and leading their temperance cause; he was elected to their highest offices nationally and internationally. ANS, 1p, 5" X 8", New York, NY, 1874 June 6. Addressed to "Dear Brother." Near fine. Mounting traces on verso. On decorative blue "Juvenile Temples of Wales I.O.G.T." letterhead, which lists Thomas as "General Superintendent" (and on which he has crossed out his hometown of Carnarvon and inserted "New York"), Thomas pens in his big, bold hand, "I have been quite delighted in visiting Peabody Salem & Massachusetts...." (In 1876, in Louisville, Kentucky, Thomas was elected Grant Treasurer of the Supreme Grand Lodge of the World, so perhaps he was on an earlier tour of American Good Templar locations.) Interesting and unusual. When the Boy Scouts of America was incorporated in 1910, one of its earliest actions was to organize a local council for Brooklyn and Queens, and its first commissioner and executive secretary was Holcombe, a cryptic figure who was also active in the settlement house movement in New York City in the 1890s. Signature on the closing portion of a TLS, 8½" X 3¼" slip, n.p., n.y. Near fine. 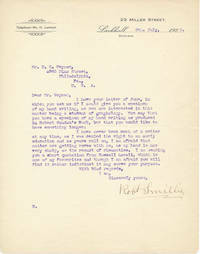 At upper left, below the typed salutation "Yours very truly," Holcombe signs handsomely in black ink, with the typed title "Commissioner" below his signature. 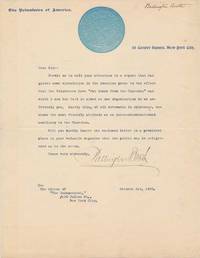 Also present is the similarly-sized masthead from the same letterhead sheet from which this signature was clipped, bearing the large ornate "Boy Scouts of America" headquarters masthead printed in blue, which cites Holcombe, notes Brooklyn, New York and bears the typed datr 17 December 1912. An unusual and exceptionally early BSA curiosity. Known as the "Conscience of America," this Socialist reformer helped found the American Civil Liberties Union in 1920 and ran for U.S. president no fewer than six times; his books include "The Conscientious Objector in America" (1923) and "What's the Matter with New York?" (1932). 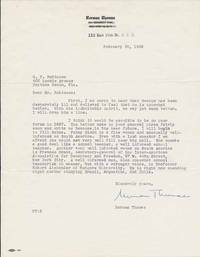 TLS, 1p, 8½" X 11", New York, NY, 1956 February 20. Addressed to G.F. Robinson. Fine. Agrees to a speaking engagement and recommends other speakers. Accompanied by a superb 1948 glossy news agency photograph (6½" X 8½") showing Thomas close up, testifying before the House Foreign Affairs Committee about a proposed revision of the United Nations Charter. The long-time president of the International Pressmen and Assistants' Union of North America (1907-48) was appointed U.S. senator from Tennessee by that state's governor at the death of Senator Nathan L. Bachman in 1937 to complete his term, but served only until 1938, failing in his bid for election. Printed DS, 4pp (rectos only), 8" X 10½", n.p., 1936 December 12. Very good. Light even age toning; tiny staple hole at upper left corner of each, not affecting text. "Excerpts from speech of Major George L. Berry, Coordinator for Industrial Cooperation," a mimeographed press release intended "For Release / Morning Papers." 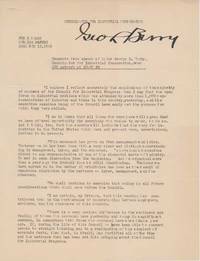 In this NBC radio broadcast, Berry addresses President Roosevelt's Council for Industrial Progress. Huge, bold full signature (using what must have been an enormous-nibbed fountain pen) near the top of the first page. Most unusual in this format. A tremendous example from the height of his fame. This Chicago activist devoted herself to a variety of civic and political reforms, showing a special concern for child labor laws in Illinois. Large, full signature, heavy stock 5" X 3" card, n.p., n.d. Very good. Vertical crease near right edge (archivally strengthened on verso) crosses "i" of McCormick, else a flawless and handsome piece from this seldom seen reformer. This American progressive reformer founded the People's Institute at Cooper Union in 1897 to educate the working classes -- when he wasn't busy with his day job as professor of German at Columbia University. 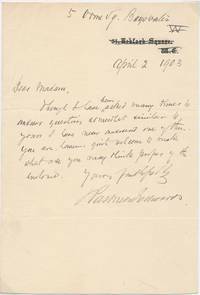 "It gives me great pleasure to send my greetings to an appreciative auditor" and full signature in brown ink, heavy stock 3¼" X 2¼" card, New York, NY, 1894 February 2. Good plus. Moderate age toning; heavy mounting traces on verso; faint mounting trace at each corner. A decent example from this lesser-known but interesting reformer. American labor leader; AFL-CIO president (1955-79). 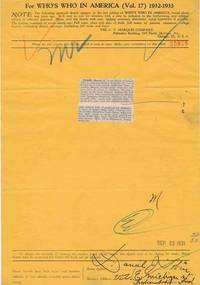 Signed Postal Cover, 6½" X 3½", cancelled in New York, NY on 16 August 1973. Near fine. Single 3-cent "Labor Day" stamp and 8-cent flag stamp affixed. No decorative cachet at left; no distracting recipient's name/address. NOT a First Day Cover, but a clever admirer had this envelope bearing an appropriate labor-related stamp cancelled in Meany's hometown (New York City) on his birthday (August 16) -- which Meany then signs large and bold in purple fineline on the "sweet spot." Quite nice. Accompanied by a superb and scarce vintage glossy 9" X 7" news agency (International News Photos) photograph. Very good. Slight bit of edgewear. Candid half-length photograph of Meany standing alongside a smiling President Eisenhower. The original, usually-absent mimeographed text (printed on cheap acidic paper) is still present, dated 21 November 1952: "George Meany, secretary-treasurer of the American Federation of Labor (right) shown as he talked with President-elect Eisenhower at the general's Commodore Hotel headquarters today. Shortly after this conference news broke of the death today of William Green, longtime president of the American Federation of Labor... Meany now looms large as possible candidate to succeed Green as head of the labor organization." An unusual signed cover and a choice desirable photograph. This noted labor leader served as long, long-time president of the International Brotherhood of Teamsters (1907-52) as well as serving as secretary-treasurer of the American Federation of Labor (1917-28). Partly-printed DS, 1p, 7 ¼" X 10½", Indianapolis, IN, 1931 September 23. Very good. Updating form sent out by "Who's Who in America," on orange paper, for their 1932-33 edition, with Tobin's 2" X 1½" biographical entry from the previous edition tipped to the blank center area. Tobin approves the entry with a large, bold signature at the close, also adding his home address. Several editor's marks in blue and red pencil and green ink make for an interesting, colorful appearance. This influential social worker helped to organize (1908) and direct (1908-17) the Immigrants' Protective League; she was crucial to the 1918 ruling declaring child labor laws unconstitutional (1918), and served as chief of the U.S. Children's Bureau from 1921 to 1934. Uncommon signature, heavy stock 3" X 2" card, n.p., n.d. Very good. Minor age toning; mounting traces on verso. "Head of national Child Welfare" inked below her signature in another, very small hand. A bold, attractive example. Second son of William Booth (Salvation Army founder); commander of army in U.S. (1887-96); after fall-out with father, founded Volunteers of America (1896). TLS, 1p, 8½" X 11", Volunteers of America letterhead, New York, NY, 1903 October 3. Addressed to the editor of the "New York Independent." Good. Faint ink transfer of text, minor soiling. Excellent content in which Booth tries to quell a rumor that the Volunteers have "Cut loose from the Churches"-- "Surely this, of all movements in existence, has shown the most friendly attitude as an interdenominational auxiliary to the Churches." Large, flamboyant signature. Famed American labor leader; AFL-CIO president (1955-79). TLS, 1p, 8½" X 11", AFL-CIO letterhead, Washington, DC, 1956 October 24. Addressed to George F. Robinson. Very good. Original folds visible but not weakened; staple holes at upper left. In this meaty and cordial letter on decorative AFL-CIO letterhead, Meany tentatively agrees to address an "Open Forum" in Daytona Beach and discusses details. Bold full signature in blue ballpoint. American philanthropist, pacifist, reformer and social activist whose early training as a black smith combined with an uncanny ability to learn languages earned him the moniker "The Learned Blacksmith"; in 1846 he formed the League of Universal Brotherhood, organizing world peace congresses and traveling and writing tirelessly for the cause. ALS, 1p, 5" X 8", New Britain, CT, 1873 May 21. Addressed to Mrs. Ogden. Very good. Paper clip rust stain at center of left edge. 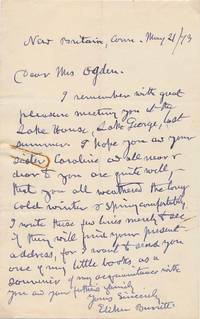 Cordial note to a lady acquaintance: "I remember with great pleasure meeting you at the Lake House, Lake George, last summer. I hope you and your sister and all near & dear to you are quite well, -- that you all weathered the long cold winter & spring comfortably... I want to send you one of my little books as a souvenir of my acquaintance with you...." A charming example. This English journalist and newspaper owner was at heart a reformer and philanthropist; his largesse helped create schools, hospitals, convelescent homes, art galleries and 24 libraries; twice he refused a knighthood from Queen Victoria. ANS, 1p, 5" X 7¼", London, England, 1903 April 2. Addressed to "Madam." Very good. Cryptic note in response to a request: "Though I have been asked many times to answer questions somewhat similar to yours I have never answered one of them. You are, however, quite welcome to make what use you may think proper of the enclosed...." An attractive example. From the collection of University of Chicago geology professor Albert Johannsen (1871-1962), author of "The House of Beadle and Adams and Its Dime and Nickel Novels" (1950), the definitive reference work on the subject. Johannsen's original 8½" X 11" file folder, bearing his printed "Collection of Albert Johannsen" label (partly filled in by Johannsen), accompanies this item.